Need a Hazardous or Flammable Cabinet fast. We can deliver to all of the UK mainland quickly except the Highlands* - just takes a little longer! 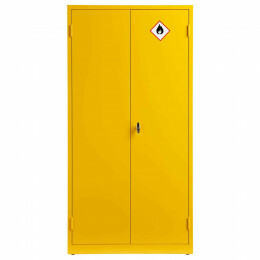 Bedford Express COSHH Cabinets, Hazardous and Flammable Steel Cabinets that can be delivered in 1-7 days if required. Some can be delivered the next working day if ordered before noon (extra cost) and others within 5 working days for the main conurbations of England and Wales and 7 working days for the rest of the UK mainland. Control of Substances Hazardous to Health Regulations or COSHH, is a law that requires employers to regulate exposure to hazardous substances that can become dangerous to employees or potentially cause wider harm. What are the businesses effected by COSHH? What should be stored in a COSHH cupboard? 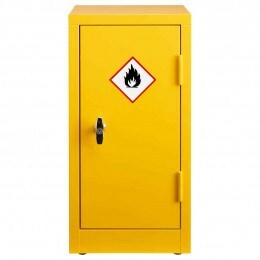 Only substances that have been specifically instructed to be stored in a COSHH cabinet should be stored inside one, you can find this information on the safety data sheet which will be given by the supplier. Examples of chemicals suitable for storage are acid, alkali and pesticides. All hazardous substances by law need to be stored in a COSHH cabinet that supplies a spill-proof container, and should not be stored alongside other dangerous chemicals if a possibility of a reaction occurring, chemicals should be grouped based on the substances hazard class code. COSHH Cabinets come in an array of shapes and sizes all specifically designed for different purposes, depending on your COSHH needs. When choosing a COSHH cabinet it is important to consider storage space, you should aim to choose a cabinet with enough space to store all same hazard class substances used in the workplace, whilst allowing enough space for any chemicals you may need to store in the future. 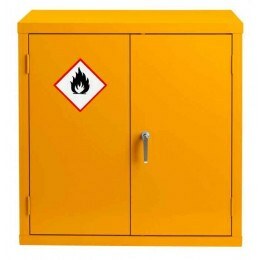 Flammable substances by law are required to be stored their own COSHH cabinet that is fireproof examples of which are the FlamStor or FlamBank, both with a fire resistance rating of 30 minutes. Choosing a COSHH cabinet that meets the environmental needs of your business and employees workplace safety is essential, for more Information concerning the regulations on substance limits and health and safety guidelines on the storage of hazardous substances workplace managers should refer to the national HSG51 and DSEAR 2002 guidelines. Should COSHH cabinets be kept outside? COSHH cabinets should never be stored outside, this is largely due to no COSHH cabinet being waterproof. If water mixes with certain chemicals this can not only contaminate the substance but could potentially cause a dangerous chemical reaction either directly from the water contamination or from over spill and mixture of substances caused by the water input. Other reasons for COSHH cabinets to be stored inside is to be protected against potential theft and unwanted access to restricted chemicals. All COSHH cabinets need to be locked at all times only giving access to responsible staff that require access to the chemicals. Do you provide a COSHH assessment template? When conducting a COSHH assessment it is important to assess the type of hazard in question and the most suitable precautions to contain any exposures. It is important to log detail on the precautionary procedures taken within the assessment to refer back to, whilst estimating the exposure limits. A checklist with all steps that should be covered during a COSHH assessment and an assessment template can be found here. What do the COSHH symbols mean? Industries: Agriculture, Engineering, offshore oil and gas, welding. Examples: Forklift trucks, Bio methane, Hospitality, Holiday Parks, Care Homes, Farming, Transport and logistics, Developers, specifiers and architects. Industries: Engineering, offshore oil and gas, welding. Examples: Dynamic breaching operations training, explosives testing, metal forming, research & development, official police duties, firework testing, special effects for film, down-hole perforating, demolition, training purposes. Industries: Agriculture, beauty, cleaning, offshore oil and gas, woodworking, hair dressing. Examples: Hairdressing, health industry, manufactures, Pharmaceutical Manufacturing, Pharmaceuticals / Health Products, Crop Production & Basic Processing. Industries: Printing, cleaning, baking, offshore oil and gas, motor vehicle repairs. Examples: Textiles, Drug Manufacturers, Steel Production, Railroads, Manufacturing & Distributing. Industries: Agriculture, baking, beauty, catering, cleaning, engineering, hairdressing, offshore oil and gas, printing, motor vehicle repair, welding, woodworking. Industries: Agriculture, cleaning, hairdressing, catering, wood working, beauty, offshore oil and gas. Examples: Drug Manufacturers, Steel Production, Pharmaceutical Manufacturing, Pharmaceuticals/Health Products, Gas & Oil. Industries: Agriculture, engineering, printing, welding, woodworking, offshore oil and gas, beauty, motor vehicle repairs. Examples: Drug Manufacturers, Waste Management, Steel Production, Gas & Oil, Construction Services. Industries: Offshore Oil and Gas, Agriculture, Printing, Hairdressing, cleaning, Welding. Examples: Drug Manufacturers, Natural Gas Pipelines, Pharmaceutical Manufacturing Pharmaceuticals/Health Products, Sea Transport, Gas & Oil. 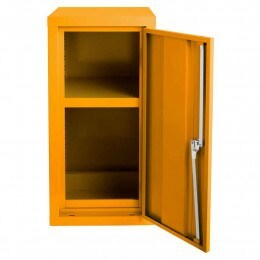 What are the COSHH chemical storage cabinet’s requirements? When using a COSHH cabinet you need to consider what is deemed as good practice with storing hazardous substances. You must take into consideration what hazardous substances are to be stored, always check the safety data sheets to ensure all required procedures are being following and access information on the exposure limits for the hazardous substances. The main area topics that should be researched before storing hazardous substances are; what are the hazards? How is the cabinet going to be accessed? Planning what chemicals need to be stored and preparing all precautionary steps needed, ensure all control procedures are in place for exposures. Make sure all required personal protective equipment is on site for dealing with the substances. Have we got the correct cleaning facilities to handle spillage? Have my staff got the appropriate training and supervision to handle these substances? When storing hazardous chemicals the cabinet should be locked at all times only allowing access to responsible members of staff that need access to the substances. It is impeccable to not only ensure you have a ventilation system but to make sure the system is switched on and fully working. When handling containers and packages it is important to handle these with the correct handling aids to minimise spillage incidents and accidents, never store sacks or drums against air vents, or grills etc. Assessments should be done regularly to look for any potential leaks or damages to containers or storage areas, if anything causes concern a supervisor should be contacted immediately. In the case of any spillage this should be addressed immediately, for liquids use granules or mats to absorb. For any solids use a vacuum or wet mopping, and ensure disposal of the spillage correctly. Hygiene is important to consider when handling hazardous chemicals, it is important to ensure that hands have been washed before and after food, drink and the use of the lavatory, never use solvents to clean your skin before handling chemicals. Always ensure that Personal Protective Equipment is being used in line with guidelines. How should COSHH records be stored? When conducting a COSHH assessment this will usually be carried out on physical paper form, then stored in a cabinet over a period of time. With advancements in technology it has made it more practical to store these assessments electronically to reduce the fire hazard of storing in physical form. What is recommended is to scan the physical assessment onto a computer and store this information on a hard drive or cloud based storage system. With legal requirements stating COSHH assessments need to be accessible for up to 40 years, storing these assessments on computers or cloud based storage is by far the most sensible and environmentally friendly approach. How often should COSHH sheets be updated? COSHH assessments need to be updated regularly to ensure that any changes in circumstances have been addressed and to assess any potential damage to storage or exposure limits. “When do I need to review my COSHH assessment?” – This will depend on factors such as what chemicals are being used, the nature of the work being conducted, and the employer’s judgement on the likelihood of any changes in current circumstances. A COSHH assessment should be reviewed immediately if any circumstances in the work place change significantly that will involve employee exposure to hazardous substances. If any evidence suggests that the original assessment is no longer valid then the COSHH assessment should be reviewed immediately. This can range from results from examining engineering controls to supervisors reporting on defects in the control systems in place. If any problems arise that require an immediate review of the assessment this doesn’t necessarily mean the whole assessment needs redoing, the point of the review is to determine if the existing assessment is sufficient and still suitable for its intended purpose. If so, then nothing more needs to be done. If the results conclude that the original assessment is out of date with the current requirements then a complete new assessment should be undertaken. It is important to review a COSHH assessment on a regular basis, without these check-ups gradual changes over a period of time may go unnoticed resulting the assessment to be insufficient. What do I not store in a COSHH cabinet? 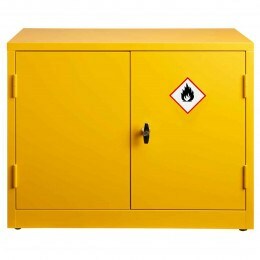 A COSHH cabinet should only store chemicals that have been deemed hazardous to health. You should not store anything in a COSHH cabinet that does not have a legal requirement to do so. It is not recommended to store several different chemicals together as this may become a hazard in itself. Depending on what chemicals you use in the work place it may be a legal requirement to have their own COSHH cabinet.